Like many of you, we actually saw snow this weekend, in October! Crazy! Fortunately, we only got a dusting and didn't lose power - my thoughts are with those of you in New England without power. Hope you have a roaring fire in the fireplace and a nice stack of books to keep you warm. We love Halloween here, so today is a busy day. We carved pumpkins last night and (finally) came up with costume ideas....kind of last-minute! Even though our sons are teens, they still enjoy trick-or-treating, and our whole family gets into the fun. 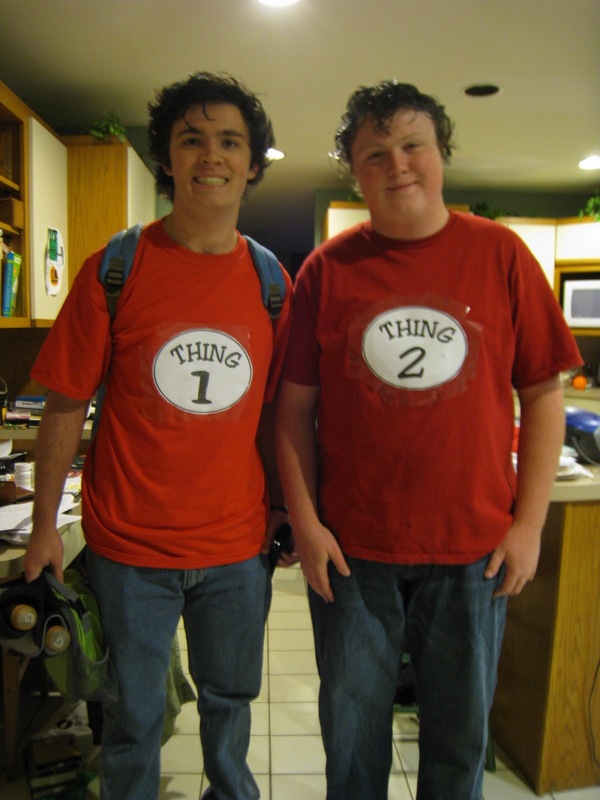 Jamie decided to dress as Thing 1 for school today (with a friend as Thing 2), so Ken immediately started in on a Cat in the Hat costume for himself. I have to hit the store today for a nightgown so I can be Cindy Lou Who. A bookish theme for Halloween - fun! I finished The Eleventh Plague by Jeff Hirsch, a newly released teen/YA post-apocalyptic novel that my husband recently read. I really enjoyed this multi-dimensional novel; you can read my review here. I decided to keep up my October theme of fun, quick reads, so I am now reading Smokin' Seventeen by Janet Evanovich. I just love Stephanie Plum and was already laughing in the first chapter! Sometimes, you need a little light-hearted fun. I finished listening to Trail of Crumbs: Hunger, Love and the Search for Home, a memoir by Kim Sunee. Though it dragged a bit in the middle when she was suffering from depression, I enjoyed it overall. My husband, Ken, is reading a thriller I gave him for his birthday, The Redbreast by Jo Nesbo, a Norwegian author who has been compared to Stieg Larsson. He says it just gets better and better and has a very intriguing plot. Jamie, 17, finished Blood Red Road by Moira Young, a much-anticipated new post-apocalyptic novel and loved it. That one is high on my own TBR list, though Jamie has made me promise I will read Roar by by Emma Clayton next. Next, Jamie re-read the first two books in a favorite series, The Gatekeepers by Anthony Horowitz, so he could read the third book which he recently purchased. He read Book 1, Raven's Gate; Book 2, Evil Star; and Book 3, Night Rise. He says this series is great! 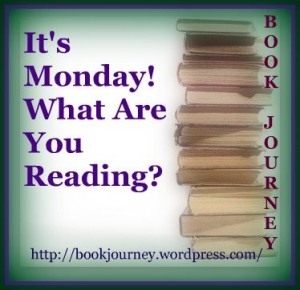 Jamie is also reading The Kite Runner by Khaled Hosseini for his World Lit class. Craig, 13, is almost finished with Woodsong, a memoir by Gary Paulsen, author of one of our favorite novels, Hatchet and its sequels. I posted two reviews this week, of The Sweetness at the Bottom of the Pie by Alan Bradley here and of The Eleventh Plague by Jeff Hirsch at Great Books for Kids and Teens. 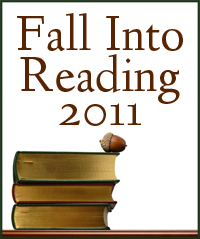 I also posted a discussion of skimming books versus reading every word for the Fall Into Reading Challenge. Hope you have a great Halloween and a good reading week! Any other book-inspired costumes out there? For years, I’ve been hearing rave reviews of Alan Bradley’s mystery series that starts with The Sweetness at the Bottom of the Pie, and I finally had the chance to read the first novel myself. It’s a fun little mystery that reminded me of my childhood days immersed in Nancy Drew books. Although this series is for grown-ups, the main character is an 11-year old girl named Flavia who – in true Nancy Drew fashion – stumbles upon a mystery and goes about solving it before the police can figure it out. Flavia is the main attraction in this novel. She is quite precocious, a delightful young loner who is picked on by her older sisters and happiest when she is spending time in her home chemistry lab and learning more about poisons. The story proceeds as most mystery novels do, with the young detective following clues, taking risks, and slowly unraveling what happened. As you can probably tell even from that brief quote above, Flavia adds an extra layer of interest, and the author uses a subtle sense of humor to enhance the story. I thoroughly enjoyed reading this clever novel – it was a pleasant diversion during what was a difficult week for me. I don’t know whether I’ll read more of the series or not. I’m not normally a hug fan of British mysteries – I enjoy one now and then but don’t normally seek them out. But if I was to read another novel of this genre, Flavia certainly adds an extra appeal to the story, and I would enjoy seeing where her sleuthing leads her. You can watch a brief video preview of the book here. Well, I tend to be a very thorough reader. I guess it's that streak of perfectionism I keep trying to get rid of but never do! I generally read every word. The only times I can think when I may have skimmed something would be either re-reading a book (like before a book group discussion of something I read a while back) or perhaps skimming a nonfiction book that I only need certain information from. Even when I read magazines, I read them from front to back thoroughly! I know, it's a sickness. I try to choose my books carefully, so I rarely dislike one so much that I can't finish. I have - rarely - read a book for one of my book groups that was so bad I couldn't finish it, but usually I give it a try. How about you? Do you skim or read every word? Well, it is now truly fall here - the weather has cooled down, and it seems as though the tress suddenly turned from all green to a riot of colors. I love this time of year! We made our annual trip to the pumpkin farm this weekend to pick out our pumpkins and gorge ourselves on still-warm, homemade donuts and fresh cider....oh, my gosh! I forgot I have a leftover donut....ah...that's better! Mmmm...cinnamon-sugar donuts and typing don't mix well. I finished The Sweetness at the Bottom of the Pie by Alan Bradley and thoroughly enjoyed it. It's like Nancy Drew for grown-ups. I want to be Flavia when I grow up. I am now reading The Eleventh Plague by Jeff Hirsch, a newly released teen/YA post-apocalyptic novel that my husband recently read. I really like it so far. It's a bit like The Road, only not nearly as dismal and hopeless. My husband, Ken, is reading a thriller I gave him for his birthday, The Redbreast by Jo Nesbo, a Norwegian author who has been compared to Stieg Larsson. He likes it so far, though he says the translation is sometimes a bit rough. Jamie, 17, finished his Dad's old favorite fantasy series, The Belgariad by David Eddings with Book Five: Enchanter's End Game, the last book in the series. Jamie was home sick all last week, so he treated himself to a book he's really wanted to read, Clockwork Angel by Cassandra Clare. He loved the Mortal Instruments series and has been looking forward to this prequel series. He and I listened to the beginning of this book on audio, but he said he preferred to read it. Now, Jamie is reading Blood Red Road by Moira Young, a much-anticipated new post-apocalyptic novel. He says it's good so far, though he doesn't like the author's convention of not using quotation marks for dialogue. This one is on my TBR list, too. Craig, 13, is reading Woodsong, a memoir by Gary Paulsen, author of one of our favorite novels, Hatchet and its sequels. He's enjoying it, though he says it's not as good as Paulsen's fiction. Last week, I posted a review of a new picture book, M.O.M. : Mom Operating Manual at Great Books for Kids and Teens. I don't normally review picture books anymore, but this one was unique! 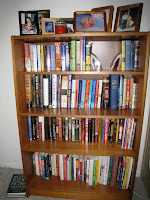 I also posted a recap and photo from my book group's meeting with author Rachel Simon, which we all thoroughly enjoyed, and a discussion of how many books we have in our house, with pictures of our overflowing bookcases! Ooh...now I have a bit of a sugar-rush headache from that donut, but it was so worth it! Quick answer: Very large and all over the house!! We have a major clutter problem, and much of that clutter is books. 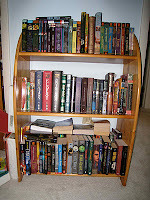 I have been trying to weed some out from the overflowing bookcases, but then they sit in piles and boxes in my office while I wait for time to either post them on half.com or give them to our local library's book sale (the collection day is just once a month, and I always seem to miss it). I also give some away to friends and to my son's school. So, let's see...we have a floor-ceiling bookcase in the living room, mostly filled with really nice hardcovers. There is a double floor-to-ceiling bookcase in the office, but that is partly work-related and reference stuff - my books on writing, travel books, my husband's old college textbooks (not that he ever actually looks at them...), even a bunch of books related to my old field of consulting (I might need those again some day...). 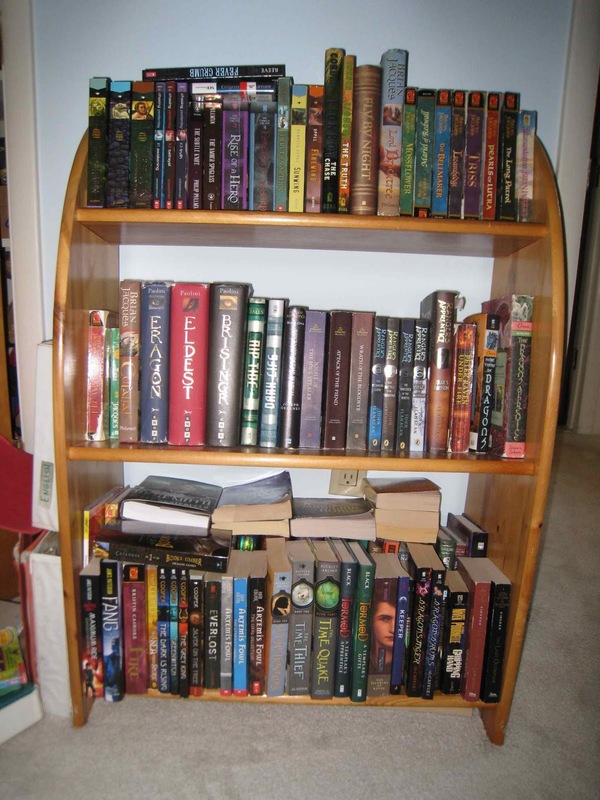 There is a full bookcase in our bedroom, and another one in each of my son's bedrooms. I have been trying to weed through all of our books. My criteria for what to keep is only books I love that I will either read again (not that I ever find the time) or lend to family and friends. Ah....I do so love books. Do you think I have a problem? How about you? 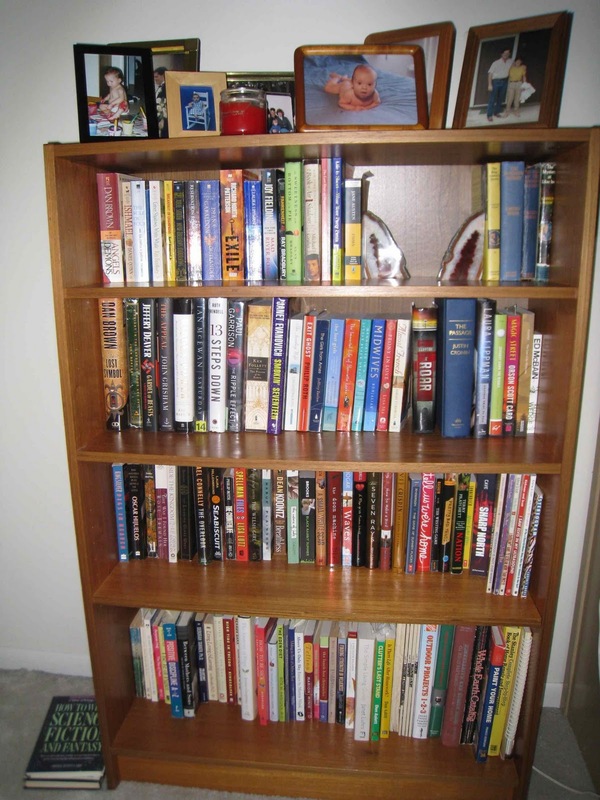 Do you have a lot of books in your house? What do you keep and what do you get rid of? And HOW do you get rid of them?? That's Rachel in the center in the purple sweater, and I am on her left, holding the book. It was an exciting night for my neighborhood book group last night! We had the pleasure of meeting and talking with Rachel Simon as we discussed her latest novel, The Story of Beautiful Girl. Rachel is also the author of the memoirs, Riding the Bus with My Sister and Building a Home with My Husband, as well as several earlier novels and short stories. We had a wonderful time and talked for hours! Rachel told us all about her mentally handicapped sister (the subject of Riding the Bus With My Sister) and how she came to write The Story of Beautiful Girl. We got the inside scoop, and her stories were fascinating. She is warm, intelligent, and passionate about her subjects, and it was a wonderful evening. If you haven't read The Story of Beautiful Girl yet, you really should. It is an amazing story, about the enduring love between a mentally handicapped woman and a deaf man, both imprisoned in an institution for years who then spend the rest of their lives trying to find each other again...and their daughter who they were forced to abandon at birth. It's a love story, lovingly written. Rachel Simon is a very talented writer, whether she's writing about her own life or the lives of Lynnie, Homan, Martha, and Julia. You can read my full review here. And I highly recommend inviting an author to one of your book group meetings! Although Rachel lives right here in our town, she also attends book group meetings via Skype, as I am sure other authors do as well. It is really a wonderful experience, to talk directly with the author of a favorite book, and I'm sure you will enjoy it as much as we did! Ah! It finally feels like fall here - I am loving the sunshine and cooler weather. Sweatshirt weather! I finished Forever by Maggie Stiefvater...which means I finished the trilogy, finally! I really enjoyed it. Check out my review of the last two books, Linger and Forever. I am now reading The Sweetness at the Bottom of the Pie by Alan Bradley, another book I've been meaning to read for a very long time. I'm enjoying it so far - it's very clever. My husband, Ken, finished The Eleventh Plague by Jeff Hirsch, a newly released teen/YA post-apocalyptic novel. He said it was good, a little dark (but then, post-apocalyptic novels tend to be dark - it does take place, after all, after an apocalypse!). Now he is reading a thriller I gave him for his birthday, The Redbreast by Jo Nesbo, a Norwegian author who has been compared to Stieg Larsson. Ken says he's still at the beginning, just trying to keep the characters straight! Jamie, 17, is still reading his Dad's old favorite fantasy series, The Belgariad by David Eddings. He has finished Book Three: Magician's Gambit and Book Four: Castle of Wizardry and is now moving onto Book Five: Enchanter's End Game, the last book in the series. He has really enjoyed this! Craig, 13, is reading Woodsong, a memoir by Gary Paulsen, author of one of our favorite novels, Hatchet and its sequels. Last week, I posted reviews of two books: When Parents Text: So Much Said, So Little Understood, a hilarious book, here at Book by Book and Linger and Forever over at Great Books for Kids and Teens. I also posted a link to a Today Show interview (and kids' review) with Brian Selzniak, author of Wonderstruck and a discussion of reading on devices versus traditional books. When Dawn at She Is Too Fond of Books recently reviewed When Parents Text: So Much Said…So Little Understood by Lauren Kaelin and Sophia Fraioli, I knew right away I would enjoy this book. I read it over the past two weeks (I admit it, I read it in the bathroom!) and laughed like crazy. The book is based on the website of the same name, started by the co-authors after they had finished college and moved back home (as many graduates must these days). It started with a fateful text from Lauren’s mom about tacos and grew rapidly from there. The website now has texts sent in by people all over the internet, and the best of them have been collected and categorized into this delightful book. ME: Okay, what’s with the winky face? DAD: No, empty dishwasher, I was being cool. MOM: You will add the dog as your facebook friend RIGHT NOW!! MOM: He is FAMILY, add him or you are grounded!!!! Ah, I could just go on all day. So many of these made me LOL that it was hard to pick just a few to share here. In fact, I often came out of the bathroom, holding the book and reading stuff out loud to my husband and teen sons, much to my own amusement (TMI?). This would make a great gift for anyone with a good sense of humor and some texting knowledge. And it really is the ideal bathroom book. It’s not for kids, though; some of these parents have real potty mouths! Check out more examples at the website, www.whenparentstext.com. Ah, this is an easy one for me. Nope, none. 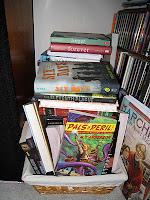 I am still 100% traditional paper books, though it's not that I have anything against all the new ways to read e-books. It just doesn't make sense financially for me. Setting aside for a moment the fact that all of these new devices (e-readers, smart phones, iPads, etc.) are expensive on their own, buying the e-books to read on them is expensive, too. Currently, I get most of the books I read either from publishers for review or from the library (i.e. free), so having to purchase e-books would definitely cost a lot more. So, while e-readers, iPads, and smart phones all look kinda cool, I have no problem reading my books the old-fashioned way for now. How about you? Do you read e-books, paper books, or both? We finally had a few gorgeous days here that actually felt like fall....but now it is in the mid-80-'s again! I was able to get outside and take some walks last week, so that was wonderful. These cool nights make me yearn to go camping, but it's such a busy fall for us, with college preparations as well as all the usual stuff, that I'm not sure when we'll be able to squeeze it in. We spent all day Sunday touring the campus at Rowan University. I finished Linger by Maggie Stiefvater and immediately moved onto Forever, the final book in the trilogy. I think procrastination paid off because it was fun to be able to jump right into the next book! 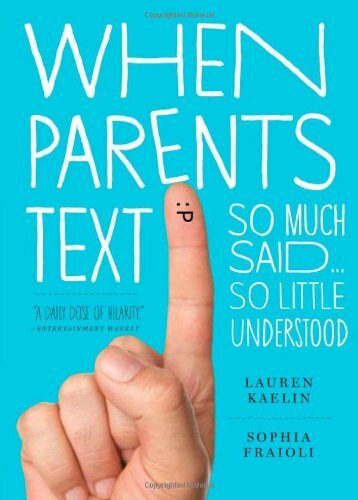 I finished When Parents Text: So Much Said, So Little Understood by Lauren Kaelin and Sophia Fraioli. I admit it - I read it in the bathroom! It's actually the perfect bathroom book...and so funny!! I am still listening to Trail of Crumbs: Hunger, Love and the Search for Home, a memoir by Kim Sunee, and enjoying it very much. My poor little '92 VW has been sitting in the garage lately because whenever I go out, I want to listen to more of this audio, so I take the newer car that has a CD player and iPod dock! Don't worry, little red car, I haven't forgotten you! Ken, finished reading The Passage by Justin Cronin and enjoyed it very much. He sort of missed the hint on the last page that there will be a sequel, so when I pointed that out to him, he said, "What?? There's another one?!" It is a long book, but well worth the time it takes to read it. Ken was looking for a quick book to read before his upcoming business trip, so I suggested The Eleventh Plague by Jeff Hirsch, a newly released teen/YA post-apocalyptic novel. He's the first one on our house to try this new novel. Jamie, 17, was back in school last week, so he had less reading time. He is continuing to read his Dad's old favorite series, The Belgariad by David Eddings. He finished Book Two: Queen of Sorcery and moved onto Book Three: Magician's Gambit. He's enjoying this classic fantasy series very much. Jamie is also reading Ishmael: An Adventure of the Mind and Spirit by Daniel Quinn for his World Lit class. Craig, 13, started a new book, Woodsong, a memoir by Gary Paulsen. His novel, Hatchet, and all of its sequels are old favorites in our house, and Craig is enjoying the memoir. I posted two new reviews last week, The Things They Carried, a Vietnam War novel by Tim O'Brien, and Bruiser, a teen/YA audio by Neal Schusterman. Both were excellent. I also posted a discussion of re-reading books for the Fall Into Reading Challenge and my Books Read in September summary. It seems so weird that September is over already - it didn't feel like September at all. It was rainy, warm, and humid here all month, so much so that the crops at our local farm were ruined by all the water and our Community Supported Agriculture (CSA) pick-ups ended a month early :( My kids went back to school, but my oldest son was home sick for a good part of the month, so it feels like fall just started this week. I got a bit behind in writing reviews, with all that was going on at our house, but I didn't do too badly last month. So, that was a nice mix of four grown-up books, and two kids/teen books, with two on audio. I enjoyed all of these. I always hate trying to choose a favorite, but I guess that would be The Pillars of the Earth. And, I also joined a new challenge this month, the Fall Into Reading Challenge. So far, I have read two of the books on my lists for that challenge, Fahrenheit 451 and Middle School is Worse Than Meatloaf (plus two more this week), so I have a good start there. What were your favorite books read in September? One of my book groups recently read and discussed Tim O’Brien’s classic novel about the Vietnam War, The Things They Carried. I guess “classic” might be stretching it a bit since it was published in 1990, but it seems to be a well-known book that has garnered a lot of praise and was recently published in a special 20th Anniversary Edition, so it seems well on its way. Besides, it says, “This is an American classic” on the inside flap. And on the title page, it says it is “a work of fiction by Tim O’Brien.” I would have mistaken it for nonfiction otherwise, an understandable mistake because it is an odd mix of fact and fiction. The narrator is Tim O’Brien, and the book is dedicated “to the men of Alpha company,” including a list of names that match the character names inside. The book consists of 22 interrelated short stories or essays about this same group of men and their experiences serving together in the jungles of Vietnam in the 1970’s. After reading the book, and one essay in particular in which the author talks about truth versus the differing perceptions and memories of different people, I think I understand that he made it fiction because it is based on his own memories and perceptions from decades ago, memories of a time that was frantic, frightening, and often confusing. So, I took this to mean that the stories are mostly true, though not necessarily all of the details. It is a sobering, grim reality. I have heard things before about the Vietnam War and seen movies that depicted it, but this was somehow more powerful and more real. O’Brien hides nothing; he lays out the violence, death, and futility of the experience in vivid detail. More importantly, he delves into the emotions of the men, especially himself, and emphasizes how people must fundamentally change when they are engaged in war. Through the stories, we get to now each of the men as individuals and see how the each responded to what was required of them. Given the wars currently going on in the world, it was a very thought provoking, deeply touching book. Two of my family members’ lives were changed forever by the Vietnam War: my cousin because he met his wife in Asia (she’s from Thailand), and they’ve been married ever since. More distressing was my uncle’s experience; he was exposed to Agent Orange there and suffered horrible medical problems the rest of his life, until his young death from cancer a few years ago. So, I found the book profoundly moving, as did most of the rest of our book group. We all felt it was eye opening, an insider’s view of war that we’d never experienced before. It is certainly a very important book for people to read, even now, to understand the real life-long consequences of sending young people to war. This fits right in with last week's Top Ten List of Books I Want to Reread. Obviously, since I made a list, I do sometimes reread a book but not very often. I have such a huge, never-ending list of books I want to read for the first time that it's hard to find time to reread something again. As you can see from my list, some of the books are favorites that I loved the first time (or first, second, and third times!) and a few are classics I read many years ago and don't remember well. I just thoroughly enjoyed rereading Fahrenheit 451 which I hadn't read since high school. I have reread some of the Harry Potter books, especially before the movies came out. So, it does happen, but not very frequently. There are just so many good books out there and so little reading time! How about you? Do you ever reread books? Wow, October already? It finally feels like fall here, after a very wet, warm, humid September. Once again, not much blogging time last week. Our oldest son has been suffering through a severe flare-up of his chronic illnesses, so we have sort of been in crisis mode around here lately. He's back in school this morning, and we are making some changes to his medications, so we are hoping October will be better. We just have to wait and see. I finished Fahrenheit 451 by Ray Bradbury and loved it (again). I intended to post a review of it for Banned Books Week, but things really fell apart here at the end of the week. I will get to it this week. It's such a clever book...and so ironic that it was banned! I am now (finally) reading Linger by Maggie Stiefvater - pure fun escapism which is exactly what I needed! I am also reading (I admit it...in the bathroom!) When Parents Text: So Much Said, So Little Understood by Lauren Kaelin and Sophia Fraioli. A fellow book blogger passed it along to me, and it is hilarious!! I keep reading texts out loud to my husband and sons. And I am listening to Trail of Crumbs: Hunger, Love and the Search for Home, a memoir by Kim Sunee, and am thoroughly enjoying it. My husband, Ken, is reading The Passage by Justin Cronin and enjoying it. It's fun to have someone to talk to about it now, but it's hard not to give too much away! Jamie, 17, was home sick most of the week, so he read a lot. He read The Last Apprentice: Rise of the Huntress (#7) by Joseph Delaney, the latest in a favorite series. Next, he read a brand-new book he picked out at the bookstore a few weeks ago - not part of a familiar series for a change! He thoroughly enjoyed The Warrior Heir by Cinda Williams Chima. Then, he finally began an old fantasy series that is one of his Dad's favorites, The Belgariad by David Eddings. He said Book One: Pawn of Prophecy was a bit slow until the end, but the action has really picked up now in Book Two: Queen of Sorcery. Ken has been trying to convince him to read this series for ages! Craig, 13, has been reading The Golden Compass by Philip Pullman. He is taking an AR test on it at school today, so he'll be switching to a new book this week. I posted just one review last week, Middle School is Worse Than Meatloaf by Jennifer L. Holm. I also wrote two lists, Top Ten Books I Want to Reread here and Top Ten Kids/Teen Books I Want to Reread at Great Books for Kids and Teens.